Warning: There will be spoilers for Life Is Strange in this post, obviously! I’ve been playing hours and hours of The Witcher 3 in the last week, but I needed a break from the witching, and the newest Life Is Strange episode seemed like the perfect palette cleanser. What I didn’t expect was the curveball Life Is Strange threw at me while I sipped my coffee. My feelings on Dontnod’s sci-fi adventure series are all over the place. It’s charming as hell, has genuine heart, and the game’s obsession with life’s mundane moments (sitting on park benches to think, watering your plants) grounds me in a world that’s otherwise over-the-top. But the dialogue often falls flat, the result of adults trying too hard to sound like teenagers. When you’re playing a story-based game, if the dialogue is clunky and unbelievable, that’s a glaring flaw. Still, you’ve got moxie, Life Is Strange. I want to see where this is going. When the credits rolled on the third episode, that was cemented. This was a LOST-like twist I can happily get behind. Let’s recap what happened, though, before I start reacting. Anyway, Max and Chloe are newly committed to finding out what happened to Chloe’s old (and missing) friend, Rachel Amber. Is she alive? Hiding? Six feet under? In my timeline, at least, they’ve dedicated their investigation to Kate, too. They still don’t know what to make of Max’s tornado-filled visions, the recent spontaneous snowstorm, and the eclipse that’s hanging over Arcadia Bay. To make matters weirder, dead birds seem to be showing up everywhere and fisherman are reporting there’s no fish to catch. Somehow, these events must all be connected. This episode is pretty boring and rote, for the most part, though I’m not surprised. We’re mid-season, and mid-season episodes are usually the weakest—games or otherwise—as the plot spins its wheels and sets up the threads to pay off for the endgame. But Life Is Strange has a little trick waiting for players at the end, one centered around Chloe. We’ve watched Chloe angrily lash out at everyone around her, friends and family alike, over and over again. In Chloe’s mind, this has everything to do with the death of her father. He died in a car accident when she was young, and if he was around, everything could be different. While staring at an old photograph, Max accidentally discovers a new power, in which she’s able to physically enter the past. Furthermore, it appears she can change the future. Wanting to help Chloe, she decides to intervene and prevent her father’s death. After tossing the car keys outside, it appears Max has succeeded. Chloe’s father takes the bus. Hot damn, he’s alive. Max did it! This would be wild enough on its own, but Life Is Strange doesn’t stop there. As Chloe approaches, Max’s faces shifts from awe to horror. Messing with space and time is, well, messy. As it turns out, Chloe is now in a wheelchair. How? Why? When? We don’t know, since the episode cuts off here, leaving players reeling. We don’t know the full extent of the consequences here. 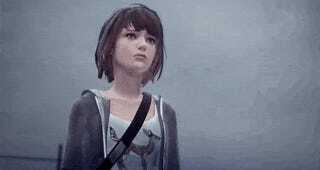 Maybe this isn’t permanent—a temporarily ripple in time—and the next episode will focus on Max flipping things back to “normal.” Maybe Max will tell Chloe, and she’ll decide to return to the original timeline. So long as Chloe gets some agency and choice in that decision, I’d probably be okay with it. It’d be an interesting idea, too. Even if Max can spin world on her finger, that doesn’t mean she’s in full control, and she’s clearly not able to grasp how one change can impact another. Bring on the next episode!